Below: A Love Like Ours was reissued with different back cover art. The back cover pictured above is the original version, released in 1999, with Streisand and Brolin's portrait. The back cover pictured below, reissued in 2000, featured a silhouette of Streisand and Brolin at sundown. Tenor Saxophone Solo: Kenny G.
To my husband ... who was the inspiration for this album. Thanks to Peter Fletcher who goes way beyond the call of duty. What I really love to do is sing LIVE with an orchestra. The majority of these songs were recorded just that way. Special thanks to the musicians who've played on this record and so many of my past recordings. Thanks also to Frank Filipetti, Frank Wolf, Al Schmitt, Felipe Elgueta, Jorge Calandrelli, Jeremy Lubbock, Matthew (DP) Della Polla, Ari Sloane and to Greg, Peter & Pat at Sony Scoring for their hospitality ... and Mark for the best cappuccinos. ... And Marty ... for always being there. 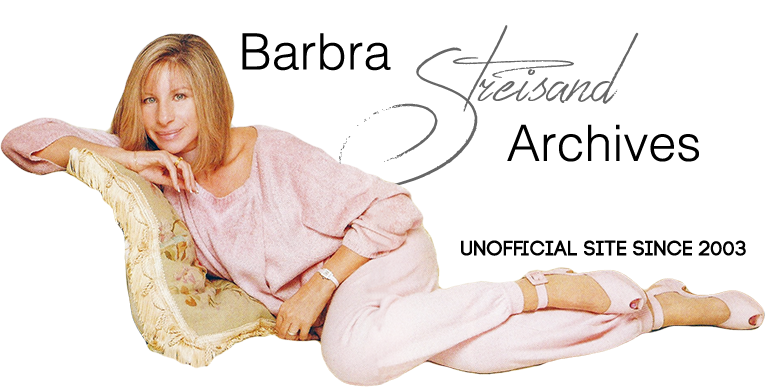 Streisand completed principal recording sessions in March 1999 and finished mixing and mastering the album in July 1999. The album and very deliberate song selection were inspired by Barbra's three-year relationship with husband James Brolin and particularly their July 1, 1998 wedding. George and Ira Gershwin's classic “Isn't It A Pity?” became Barbra and Jim's favorite song and was used on their wedding day to welcome the newlyweds to their post-wedding celebration under the supervision of Marvin Hamlisch, who announced them as “Mr. and Mrs. Brolin.” Originally included in the Gershwins' 1932 Broadway musical, Pardon My English and previously recorded by Ella Fitzgerald, Michael Feinstein, Johnny Mathis, Mel Torme, and others, the song perfectly described the wedding couple. The album's title song, “Love Like Ours,” was composed back in 1986 by Dave Grusin, with lyrics by Alan and Marilyn Bergman. Broadway composer Cy Coleman debuted the current version of the song during a Carnegie Hall concert tribute to the Bergmans in early February 1999. Written by Clay Blaker and Roger Brown, “We Must Be Loving Right” was previously recorded by George Strait and included on his Easy Come Easy Go CD. In fact, Streisand commissioned celebrated producer and MCA Nashville president Tony Brown to produce her version in L.A. virtually exactly as he had done for Strait, complete with steel guitars. The song was co-written with Roger Brown. “Roger writes a real jazzy kind of melody. It really fit her,” Blaker said. “If I Didn't Love You” is the third “If” song on A Love Like Ours. Bruce Roberts and Junior Miles wrote it. “Junior Miles” is the songwriting pseudonym for Edgar Bronfman, Jr., part of the family whose fortune came from the Seagram Company. He wrote the lyrics to this song when he was courting his second wife Clarisa. Stephony Smith and Steve Dorff wrote “It Must Be You”. “The lyrics are very simple, vulnerable,” Barbra wrote in her liner notes. She also harmonized with herself on the song’s bridge. Steve Dorff actually recorded this song himself on his 2004 album You Set My Dreams To Music. Streisand reworked “The Music That Makes Me Dance,” which was written by Jule Styne (music) and Bob Merrill (lyrics) and performed a thousand times by Barbra during her pre-Broadway, Broadway, and London runs as Ziegfeld Follies star Fanny Brice in the stage musical Funny Girl. Streisand hasn't performed the song since since the mid-60s when she rearranged it for London and some U.S. concert performances. Streisand's original recording of the song appeared on the 1964 Funny Girl - Original Broadway Cast Recording (it was not included in the movie) and the My Name Is Barbra TV special. For A Love Like Ours, Barbra Streisand recorded a fresh rendition of the show-stopping Act II song, which features Kenny G playing the original tenor sax part and enjoying a brief solo. Note: Much of the text here in the “About the Album” section was written by Mark Iskowitz for his Barbra Streisand Music Guide website. It is reproduced here with Mark's permission. When A Love Like Ours was released to stores, Sony included EarthLink’s™ Internet software on the disc as a CD EXTRA title. Streisand publicized the album by participating in various interview segments for television, including Rosie O'Donnell's talk show and the Today Show. Wonder why Streisand looks the same in the various interviews she did? (see the TV page, the 90s). Columbia and Barbra's handlers rented a Malibu home (near her own) and provided the camera equipment and lighting. American and International crews then conducted their interviews and Streisand's people provided the final tapes to them. A Love Like Ours debuted at #6 on the chart dated 10/9/99, based on approximately 145,500 copies sold between 9/20 and 9/26/99. Streisand's duet with Vince Gill was filmed as a music video by director Jim Shea and cinematographer Andrzej Bartkowiak. They filmed the video at Sony Pictures Studios in California on 23 August 1999. Photographer Albert Tolot captured the image for the cover of A Love Like Ours (and an alternate shot was used for the packaging on the single, “I've Dreamed of You”). Paparrazi captured photos of Streisand and her husband James Brolin on the beach in Malibu while they were waiting for the sunset. Finally, video director Jim Shea took the following publicity photographs of Streisand, probably on the set of “If You Ever Leave Me”.